Open the bean package and set aside the seasoning packet. You’ll need it later. Soak the beans overnight in a big bowl with a lot of water (soak at least 8 hours). The beans expand a lot so make sure you fill the bowl up with a lot of water. You can also do the quick soak method (instructions for that are above). Drain the water and rinse the beans. Place the beans in the bottom of a large slow cooker. 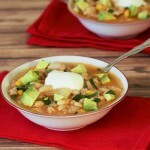 I like to use at least a 6 quart slow cooker for this recipe. In a microwave safe bowl combine the diced onions, minced garlic, tomato paste, chili powder and minced chipotles. Microwave for 5 minutes, stirring every 90 seconds or so. Add the mixture to the slow cooker. Add in the salt and 5 cups of water. Then add in the chicken. I like to use frozen boneless skinless thighs because the beans take a long time to cook and this ensures that the chicken and beans will get done at the same time. Thanks so the amount of liquid encompassing the chicken in this recipe the meat will stay moist even if the chicken is not frozen. Cover and cook on LOW for about 8-10 hours, or until beans are tender. Alternatively, you can cook on HIGH for 5-6 hours. Each slow cooker is different and cooking times can vary. But these cooking times should be somewhat close to your slow cooker. Remove the lid and remove the chicken to a cutting board. Shred. Ladle out 2 to 3 cups of beans and add them to a blender or food processor. Puree the beans. Be careful because they are very hot and this can make the blender lid explode off and coat your kitchen with beans. I like to start on the lowest setting and kind of vent the blender lid a bit. Once the beans are pureed, stir them back into the slow cooker. Stir the chicken back into the slow cooker. This step is important! Add in the seasoning packet. Stir. Then add in salt to taste. I needed a whole teaspoon to get it to the right taste. Add in pepper to taste. Add in corn and stir. Serve with minced cilantro, diced avocados and a dollop of sour cream.